Okay, so I love these cheap screw-on-leg tables. Back in the day, we covered them in burgundy table clothes with a ruffle around the bottom, then maybe a Lacey thing, then the glass, and thennnnn some fancy figurines and dried flower bouquets.... I'm embarrassed to say I am describing what sat in my living room for way too long! But these babies are FUN to paint! They soak up the paint INSTANTLY and there is no need for sanding or Wil Bond, or any other such extras! looks zebra to me!!! 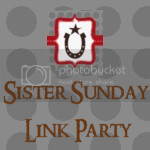 thanks for linking up to Sister Sunday!!! Its a good attempt at zebra! i do love this little table :) It would be nice to have a zebra stripe stencil, it might of made my bathroom wall a little easier. I thought zebra as soon as I saw it. Great makeover! Thanks so much for linking up today! I thought "Zebra" when I saw the paint job too! Hubby just needs a hug :) He'll see better after a hug, trust me.